A Monthly Organ Devoted to Universal Knowledge / Guide to a Higher Life. New York, NY, Chicago / Champaigne, IL, Nanaimo, B.C., Canada, and (March 1937 on), Oakland, CA. Publisher: Universal Pansophic Society / Pansophic Publishers. Editor: Heinrich Tranker. Corporate author: Universal Pansophic Society for North America and Mexico1/1, April 1935-March 1940. $1.00 a year, (paper-), $1.75 (cloth-), $3.00 (leather-bound); 15 cents a copy. 6 x 9. Ten to 40 pp., with some issues book length. The first few numbers were reproduced from typewritten sheets and printed on only one side of the pages. This was the organ of the Societas Pansophia Universalis founded by Tranker (1880-1956) in New York in 1932, which was a continuation of Tranker's Collegium Pansophicum founded by him and his wife in Germany in the early 1920s. 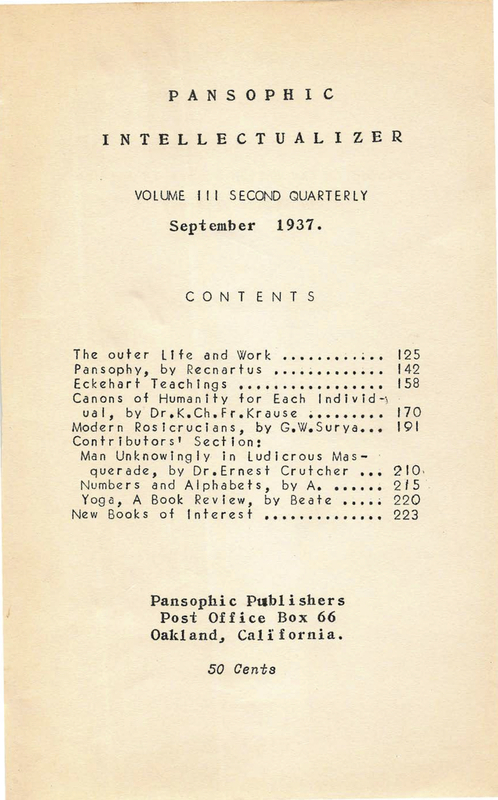 As the journal explains: "The Universal Pansophic Society is a purely spiritual organization whose cause is espoused by its members through voluntary contributions. Membership in time leads to initiatory schools that have as the final aim: To know and feel God is the most precious experience of humankind." The society, in other words, was to act as a "pool" from which those displaying suitable aptitude would be selected for higher initiation. The journal published selections from Franz Hartmann, "G.W. Surya" (Demeter Georgievitz-Weitzer), and the nineteenth-century mystic Karl Christian Friedrich Krause, but was largely Tranker's own work. Tranker was a Theosophist and self-made initiate, and was one of those who sought to don the mantle of Theodor Reuss in the rites of Memphis and Misraim and other groups after Reuss' death. On Tranker, see Peter Koenig, "Heinrich Tranker, Karl Germer, Henri Birven, Spencer Lewis, C.H. Petersen. Of Booksellers and Other Grand Masters," online at http://www.parareligion.ch/sunrise/book.htm. NYPL; LOC.